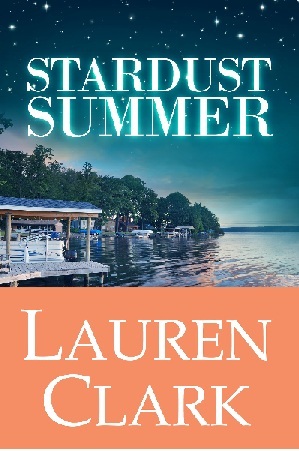 When searching for the perfect title and best cover art for my latest book, Stardust Summer, I’ll admit that this novel presented me with several challenges. My first two novel titles came into my head fully formed (Stay Tuned and Dancing Naked in Dixie), but, this time, finding the right title took almost as long as it did to type, edit, and proofread the entire manuscript! Stardust Summer explores the tragic loss of a daughter-father relationship and how those ripple effects play out over the course of several weeks in Upstate New York. Single mom Grace Mason is wrenched out of her idyllic, quiet existence as a teacher in Mississippi when her estranged father suffers a heart attack. Grace’s journey is a physical and emotional one, as it forces her out of her comfort zone—and straight into facing a multitude of issues she’s kept buried since childhood. While the story does examine family dynamics, parental drama and broken bonds, the manuscript is not purely a tearjerker. The novel also explores opportunities for forgiveness and second chances—and finishes on an uplifting note (for those of you who like happy, but not cookie-cutter-perfect endings). One day, about two months ago, after reviewing what felt like one hundred possible combinations for my title, I stumbled across Frank Sinatra’s version of the song, “Stardust.” The haunting melody seemed to fit the mood and manuscript, and I added the “Summer” to represent the season during which the book takes place. Thankfully, the cover concept came a little easier, with many thanks to my brilliant creative designer, Damonza. I sent him recent photographs of Keuka Lake in Penn Yan, New York, where the story takes place. Perhaps I’m biased, but I am thrilled with the result and feel that he captured the essence and magic of a “Stardust” time of the evening—a deep blue twilight—when the color begins to fade from the day and the moon and stars peek over the horizon. The water’s edge image that Damon chose for the cover also accurately depicts Keuka Lake’s shoreline. The photograph bears uncanny resemblance to the scene from my parents’ cottage; a vision which I can bring to mind in a moment’s notice. When I close my eyes, I can almost hear the water lapping against the dock, the soft purr of fishing boat engines, and the flap of birds’ wings in swaying trees overhead. The air is sweet and fresh, perfumed with peach groves and berry-ripe bushes along gravel paths. I also love that the title and cover design represent the end of a day, which, on a conceptual level, can also represent the conclusion of Grace’s relationship with her father. While this transition isn’t easy, the stars in the sky make me think of heaven and afterlife, which bring comfort to Grace, her son, Evan, and Henry’s wife, Kathleen. I’ve often spent long evenings on the dock outside my parents’ cottage, contemplating life and love—I’d like to think that Grace would be doing the same—and knowing that, for her, the sun will come up in the morning. Part of Grace’s journey is the realization that forgiving her father and forgiving herself free her to live the rest of her life in a healthy and happy way. She becomes a better mother, a better friend, and a better daughter, even after her father’s death. How do the titles of books and cover art impact the novels you buy? What are some of your favorite, most memorable book titles? Single mom Grace Mason doesn’t believe in miracles, magic, or love at first sight. She likes the quiet life, complete with her eight-year-old son, their tiny house, and her teaching job. For Grace, happiness means that nothing much ever changes in Ocean Springs, Mississippi. Next My Weekly Update – Edits, Please.